The Sowerby's beaked Whale is characterised by a spindle-shaped body, with a small head, small dorsal fin located about two-thirds of the way back from the snout tip, small and narrow flippers and an un-notched tail fluke. It also has a long, thin beak, a prominent bulge on the forehead and a single pair of narrow throat grooves. Two flattened, traingular tusks erupt at the side of the mouth from the lower jaw in adult males, but without a close look at the head even bulls may be difficult to distinguish at sea from other Mesoplodon species. Colouration is typically indistinctive. 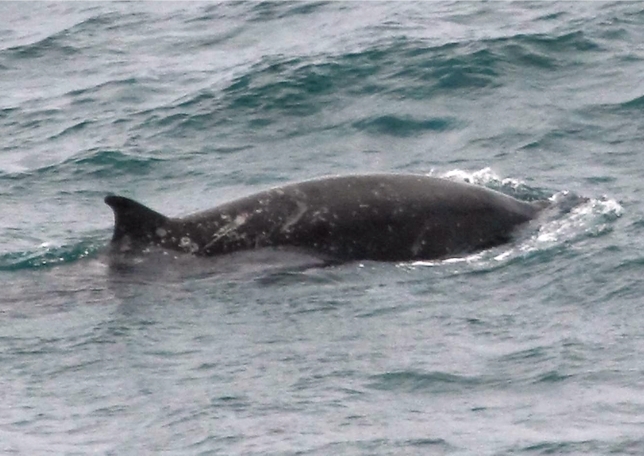 That saying, with its charcoal grey back, the species is generally darker than other beaked whales in its range. The belly is countershaded lighter than the back and the body syrfaces of maturer animals may exhibit white or light grey spots resulting from cookie cutter shark bites. Scarring in males of the species is generally observed in the shoulder region and lower flanks and consists of single scratches (as oppose to paired scarring in Cuvier's whales). Sowerby's whales range from Nantucket to Labrador in the Western Atlantic and from Madeira to the Norwegian Sea in the East, and is perhaps the most northernly dstributed of the Atlantic Mesoplpodon species, with most records above 30 degrees north in northern Europe, hence the high incidence of strandings records in the northern UK. Their range is known to include the Baltic Sea, but only rarely (possibly as a stray) the Mediterranean. As with other members of this family, the species occurs in deep waters beyond the continental edge. The species is known to reach 5.1 metres in females and 5.5 metres in males, with a weight of up to 1300 kilograms. The gestation period lasts for 12 months and the young are born at a length of 2.4 to 2.7 metres with a weight of around 185 kg. The breeding season appears to be in late winter to spring, but essentially nothing else is known about the reproductive biology of these animals. Very lttle is known about this species other than from occasional sightings and strandings. They have been occasionally seen in groups of 3 to 10 individuals of mixed composition and mass strandings of the species further suggest its sociality. Recorded dives have been shown to last between 12 and 28 minutes, the whales rising from the water at a 45° angle when surfacing. Breaching, spy-hopping and fluke slapping have been observed and there have also been a handful of incidences when Sowerby's whales have approached vessels. Dietary analysis from stranded animals suggests they primarily feed on squid and molluscs, but cod has also been found in the stomach contents of several stranded animals.